Strictly speaking, hepatitis is a chronic liver inflammation. Feline hepatitis is however commonly used term to describe number of liver conditions in cats. Feline hepatic lipidosis is the most common type of liver failure in cats, followed by cholangiohepatitis. These two types of hepatitis in cats account for about two-thirds of all feline liver diseases. Other feline liver diseases include infectious liver diseases like feline infectious peritonitis and toxoplasmosis. Feline liver cancer and leukaemia that begin in the liver or spread there from other locations can also cause liver insufficiency. Feline liver failure symptoms can be vague and non-specific. Early symptoms often include loss of appetite, weight loss, diarrhoea, and vomiting. As the feline liver disease progresses the symptoms become more severe, like ascites (build-up of fluid in the peritoneal cavity), jaundice, and seizures. You should always seek professional advice if your cat is showing any sudden or prevailing abnormal symptoms or behaviour. As they say, it is better safe than sorry. Hepatic lipidosis is also known as feline fatty liver disease. 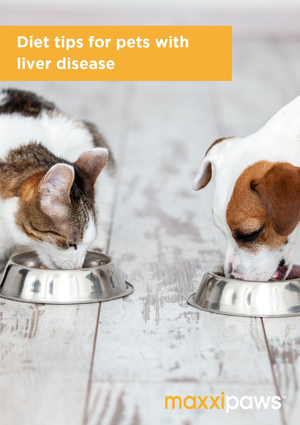 For some reason hepatic lipidosis is much more common in cats than dogs. Actually, feline hepatic lipidosis is the most common liver disease in cats. Hepatic lipidosis occurs when triglycerides (the main form of fat in the body) accumulates in the liver cells (hepatocytes). The excessive fat in the liver increases the liver size and causes abnormal bile flow that interferes with the liver function. This affects the liver capacity to filter toxins from the bloodstream. The exact cause may be unknown but feline fatty liver disease appears to be a type of anorexia that occurs when a cat has a sustained loss of appetite and stops eating. There can be either physiological or pathological reasons for why cats stop eating, i.e. underlying disease or the cat may be stressed, e.g. when left with unfamiliar people or when new pet is introduced to the household. Feline hepatic lipidosis may sound serious and it can be if left untreated. Early intervention is very important. Treatment for feline hepatic lipidosis contains intravenous (IV) fluid replacement, force feeding and nutritional supplementation (like maxxiSAMe). One of the many functions of the liver is to produce bile, but it helps in the digestion of fats. Cholangitis is an inflammation of the bile ducts and when the liver is also inflamed, it is called cholangiohepatitis. Is a bacterial infection from the intestine causing inflammation? Neutrophilic cholangitis starts as acute but can become chronic if not treated aggressively early on. Symptoms of acute neutrophilic cholangitis include sudden loss of appetite, vomiting, diarrhoea, fever, abdominal pain, and jaundice. Treatment with appropriate antibiotics and supportive care is required, but the prognosis is usually good if treatment is started early on. If the disease becomes chronic then treatment will include immunosuppressive drugs (corticosteroids) as well. Is a non-infectious inflammatory liver disease that usually causes enlargement of the liver and can cause fluid accumulation in the abdomen (ascites). Treatment consists of anti-inflammatory and immunosuppressive drugs (corticosteroids). The prognosis varies on the severity of the condition so early diagnosis is important. In some cases, prolonged or life-long treatment is required, and relapses can occur. Feline liver fluke (Opisthorchis felineus) is a trematode parasite (flatworm) that lives in water and is only found in subtropical and tropical areas. The severity of symptoms depends on the severity of infection. However, most infested cats remain asymptomatic (have the parasite but do not show any symptoms). Treatment can include medication to kill trematode spores and parasitic worms, as well as antibiotics and prednisone. Supportive care is in all cases necessary as well, i.e. to allow the biliary system and liver to heal, and to support the cat's recovery. Supportive feline cholangitis care includes vitamin K injections, pain relief, proper nutrition (may require feeding tube), Ursodeoxycholic acid (to improve bile flow and decrease inflammation), as well as SAM-e and other antioxidants supplementation. Feline hepatic failure or acute liver failure in cats is a condition characterized by sudden loss of 70% or more of the liver's function due to sudden, massive tissue death in the liver. Necrosis (tissue death) sets in, causing loss of liver enzymes and impaired liver function, ultimately leading to complete liver failure. Acute liver failure can be fatal if left untreated. In most cases, hospitalization is required, i.e. for IV fluids, electrolytes, and oxygen, as well as colloid replacements. Activities have to be restricted for a while to allow time for the liver to regenerate. 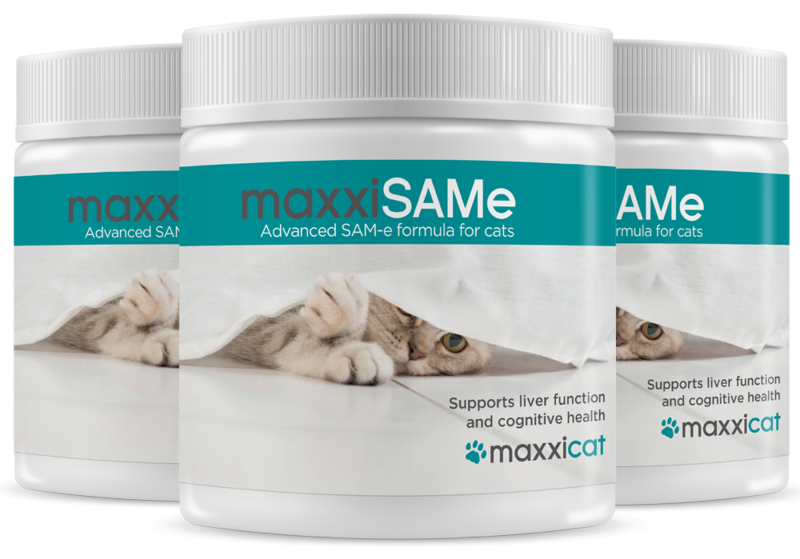 Vitamins (E and K), antioxidants, and liver supplements for cats (like maxxiSAMe) are also beneficial after acute liver failure. Feline infectious peritonitis (FIP) is a viral disease caused by certain strains of a virus called feline coronavirus. It affects many systems of the body, including the liver. Feline infectious peritonitis is a progressive disease and is unfortunately in most cases fatal. Infection with coronavirus is actually quite common in cats but fortunately in most cases it does not cause any health problems. But sometimes the virus changes to the strain of coronavirus that causes FIP. Most cats that develop feline infectious peritonitis are under two years of age though cats of any age may develop the disease. Cats with weak immune systems (e.g. kittens, cats with leukaemia, geriatric cats) are most likely to develop feline infectious peritonitis. Currently there is no known cure for feline infectious peritonitis so the disease is in most cases fatal. Treatment therefore consists of supportive care, i.e. good nutrition and medication, like corticosteroids, antibiotics, and cytotoxic drugs. IV fluids, draining accumulated fluids and blood transfusions are also used when applicable. Even though feline infectious peritonitis is not highly contagious disease, it is important to take care in multi-cat households and avoid overcrowding. Good hygiene is another essential strategy for minimizing the risk of FIP. Toxoplasmosis is caused by the Toxoplasma gondii parasite that can be found in raw meat and garden soil. Cats usually get toxoplasmosis by eating infected raw meat (e.g. prey) or from rooting in infected soil or ingesting cat faeces. Most cats become immune to toxoplasmosis through exposure to the parasite. It is most dangerous for kittens that are infected in the womb. Those that survive are more likely to show symptoms than adult cats but symptoms include lack of appetite, fever, laboured breathing, and jaundice. Antibiotics do not kill the parasite, but they can still be effective treatment and clear up most of the symptoms. Feline toxoplasmosis can be passed on from cats to human. It is though not common as most people are immune to the disease as they have already been exposed to Toxoplasma. However, people with weakened immune systems are most of risk of contracting toxoplasmosis. Pregnant women need to take special care around cats as if they become infected the foetus will also become infected and it can have serious consequences for the unborn child (developmental abnormalities, miscarriage or stillbirth).